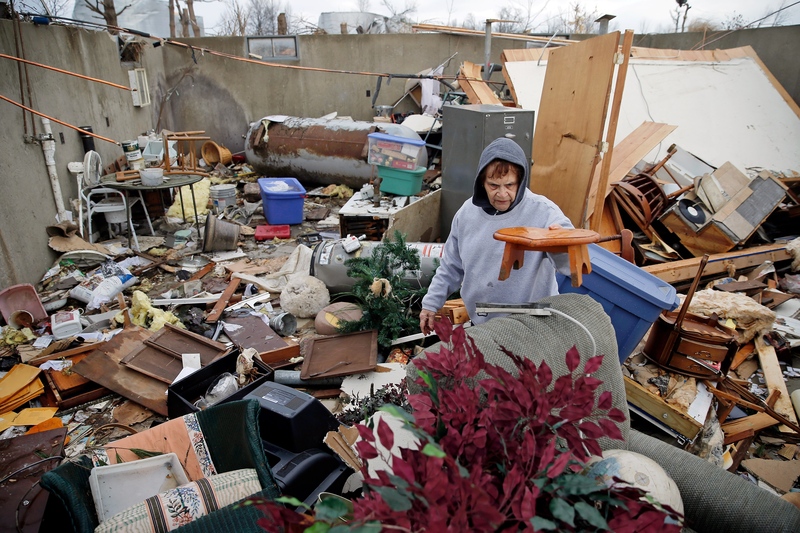 Pat Harber of Perryville, Missouri, looks through the wreckage of her home. Recently, the Midwest has been hit hard with an overwhelming amount of tornadoes, causing extreme destruction of people’s homes and communities. According to the National Weather Service, 26 tornadoes ripped through parts of Iowa, Missouri, Tennessee, Illinois, and Indiana in one day. The following day tornadoes swept through Kentucky and West Virginia. A plethora of people have been left injured and without homes. At least three people have been killed and cars have been left strewn along highways. In Nashville, Tennessee, tornadoes tore the roofs right off of houses. In Clarksville, a town about an hour away from Nashville, a tree fell on a mobile home, leaving a small boy with numerous broken fingers. In Missouri, one person was killed as a twister blew about 20 vehicles from a junkyard onto Interstate 55, tossing and crushing him. About 60 families within a 13-mile radius had lost everything they ever had. In Ottawa, Illinois, the storm became so severe that a tree ended up falling on Wayne Tutland, 76, killing him and injuring his companion. He and his companion were burning debris in his yard when a neighbor warned them that a storm was approaching. In many other states, the damage was extensive and threatening. Many people have been treated for their injuries since then and many have been left without power for days. The damage caused not only by tornadoes, but also by large golf ball size hail.